The always very busy month of September is coming to an end after a marathon of different fabric fairs across the globe. While we are still catching our breath and try to get on top of our emails, it dawns on us, that there are only 3 months left before we do it all over again. 2018 is heading our way quickly. Before we get caught up in Christmas preparations, before summer holidays start in the Southern hemisphere and before we need to do our end of year accounting, it is a good moment to start planning for 2018. This is where the Wool Industry Calendar 2018 can help. To make your planning easier, I have prepared a calendar that you can download at the bottom of this page. The calendar includes all wool industry related dates for 2018 as far as they are already available. Where possible I have linked the websites of the fairs and events, so that you can have very easy access to each event’s website. So for example, Heimtextil takes place between 9-12 January 2018 and you will find it in the calendar linking to the Heimtextil website. The overview of all relevant industry fairs makes it easy for you to plan your year, decide which fairs you are going to exhibit and participate in. You can start checking for flight and accommodation options and arrange meetings with your clients. One important success factor is continued learning and networking. Attending industry events like the IWTO Congress, FAWO Wool Week or Nanjing Wool Market will give you the latest industry developments, insights, trends as well as new inspiration and offer you many networking opportunities for your business. We often don’t allow enough time for personal development and networking, therefore I encourage you to think about which event you will attend in 2018 and make time available. Planning your year is of course not only about exhibiting, travelling and participating. A lot of work also needs to happen at home in relation to these wool industry events. What do I mean by that? Each and every event is also an opportunity for your business to create and introduce new products, activities, events and content. Fairs and events are a fantastic deadline for you to get things done because there is no way you can move the exhibitions or events deadline. These industry events give you the opportunity to showcase your new ideas, meet new prospects etc. While I cannot help you with what kind of products you need to create, I would like to encourage you to also think about the content you can create in relation to these industry dates. What kind of content am I talking about? Content for your website, content for your social media accounts and any other content that your customers can interact with. There are several types of content you should consider when planning your year ahead. The future is video. Every day YouTube users consume on average 40 minutes of video content online (and this is only YouTube not including videos watched on Facebook). Videos make your website and your social media posts more engaging and you can get your message across much more easily. When you plan your events, meetings and activities, also think about what kind of video opportunities you will have or can create. You need to decide if you need a video team to assist you or if you can take videos yourself. One quick video opportunity is to do live videos from events where you can give a short report of what you learned or saw. The second most important asset for your online and social media communications are images. Before you attend a fair or event, think about what kind of images would be useful to have and also share with others. Once you have these ideas noted down it will be easier for your team and you to make sure you get the shots you need. Image ideas can be products you exhibit, new products and trends that you come across, people you meet, images of your stand, behind the scenes, speakers on stage etc. Fairs and events are always a great opportunity to meet with a lot of different people. You could use this occasion to interview people either on video or audio and publish it either directly to your website and social media platforms. Or use the interviews you gathered to write a blog post or report. Here again, it takes a little bit of planning beforehand of preparing questions and identifying the people you want to talk to. Adding new content to your website to keep it up to date and relevant is also important. Fairs and events offer new content to write about on your blog. You can write new articles before, during and after a particular event. Wool events also offer the opportunity to write a detailed report about a certain topic that was discussed at an event. These reports can be of high value to anyone who was not able to attend the event themselves. Longer reports might take some time to write but can help position you as an expert and trusted source. Some events you may not be able to participate in yourself. Still, you can look out for content that is published before, during and after the event and share it on your social media platforms. This can be videos, images, blog posts and reports other people or companies published that you can then share with your audience. Social media shows success if done consistently, meaning we need to show up, participate and post content regularly. Sometimes it seems hard to find content to share and post. The wool industry calendar can also help you plan your social media activity in advance and give you inspiration as to what topics are current and of interest to your audience. Keeping an eye on the wool calendar can give you inspiration for what kind of news to search and look out for. Within the calendar, I have also included a few so-called ‘Days of the Year’. 27 October, for example, is ‘Hug a Sheep Day’ or 3 May is ‘Lumpy Rub Day’. I have included only the types of days where I felt they had some sort of connection to the wool industry. They can be a fun occasion to put up a post to make people laugh, inspire them or raise attention for a cause. Did I miss any important fairs, events or dates? Do let me know and I will include them in the calendar as well. I will also update this calendar towards the end of 2017 as new dates may become available. Look out for the update. 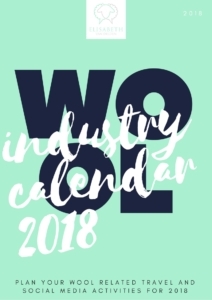 Download the Wool Industry Calendar 2018 here.